June 22nd 2015. AH Technology (Aust), the distributor of Raz-lee Security inc. a major developer of security, auditing & compliance software solutions for IBM i systems, announced thatSyslog real-time notification messages now support TLS encryption in all iSecurity products. With the ever-increasing awareness of cyber threats and the need for organizations, especially world-class multi-national financial institutions, to encrypt communications transmitted outside the immediate confines of the data center, RazLee has answered to the technological challenges posed by its customers to support Syslog encryption. To quote Wikipedia: "Transport Layer Security (TLS) and its predecessor, Secure Sockets Layer (SSL), are cryptographic protocols designed to provide communications security over a computer network. They use X.509 certificates and hence asymmetric cryptography to authenticate the counterparty with whom they are communicating and to negotiate a symmetric key. This session key is then used to encrypt data flowing between the parties. This allows for data/message confidentiality and message authentication codes for message integrity and as a byproduct, message authentication." iSecurity's Syslog feature sends real-time security-related events originating anywhere on the IBM i (i.e. QAUDJRN system journal, remote network access, MSGQs, jobs, users, etc.) to remote Security Information and Event Management (SIEM) servers. Events can be pre-filtered on the IBM i based on any field or combination of fields and event contents and structure can be easily defined on the IBM i making integration with all SIEM products easy and quick to implement; as such, the Syslog messages can include event-specific data! Performance has been optimized to the extent that one Raz-Lee customer, a mediumsize insurance company, uses iSecurity Syslog to transmit the entire journal receiver log to their SIEM product, entailing thousands of messages per second utilizing only 1% of the CPU. "As the first IBM i security vendor to support Syslog encryption using TLS, Raz-Lee has again answered the requests of its customers and remains in the forefront of IBM i technology," said Eli Spitz, VP Business Development, Raz-Lee Security. "In addition, our Syslog support enables users to decide under which conditions to send a Syslog message, to choose the IP address of a specific SIEM server, the facility from which the message is sent, the severity range, etc. AH Technology (Aust) is the representative of Raz-lee Security in Australia, New Zealand and SE Asia. 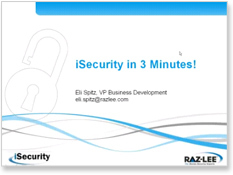 Raz-Lee Security, is the leading security solution provider forIBM's IBM i (AS/400) computers. Drawing upon its more than 30 years of expertise in the IBM I Performance and Optimization market, the company designs, develops and markets a comprehensivesuite of advanced security software solutions - iSecurity.